After much analysis, our Q4 2012 report is finally published today. 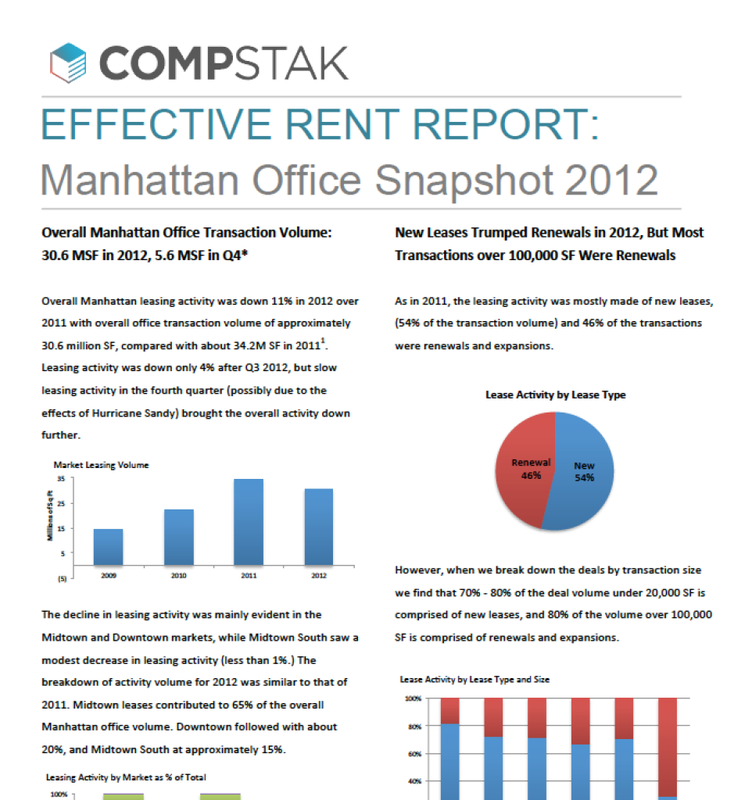 CompStak looked at office transactions totaling 30.6 MSF in Manhattan, a transaction volume which represents nearly 100% of all transactions that took place last year. In other words, our report is not a sample but rather a census. Effective Rents in all Manhattan markets increased for the year, although Midtown was mostly flat in the fourth quarter. Midtown South: Rents increased 30% for the year and 7.6% for the quarter. Landlords could not increase asking rents fast enough and the Asking Rent - Starting rent spread narrowed to a sliver in Q4. Downtown registered an impressive 10% quarter over quarter increase in Effective Rents. About 70% of the deals over 100,000 SF this year were renewals. About 70% of the deals under 20,000 SF were new leases.